Employers are required to provide employees with personal protective equipment to minimize hazards in the workplace, according to the U.S. Department of Labor Occupational Safety and Health Administration (OSHA). This personal protective equipment is necessary if an employer's other engineering, administrative and work practice controls aren't sufficient to provide the protection needed. OSHA requires that many categories of this equipment meet standards developed by the American National Standards Institute. Employers must offer training to their workers on how to use personal protective equipment. Employers must train and, if necessary, retrain employees who use personal protective equipment on why it's necessary, what equipment is necessary and the limitations of this equipment. Employees in these training programs must learn how to properly don, remove, adjust and wear personal protective equipment as well as how to correctly care for, maintain, use and dispose of this equipment. OSHA suggests that professionals such as carpenters, electricians, mechanics, plumbers, welders and assemblers complete personal protective equipment training for eye protection. Employees in training should learn about safety spectacles, goggles, welding shields and face shields. They should learn that workers who usually wear prescriptive corrective lenses must wear accommodating eye protection or additional protection over their lenses. Training should teach the types of injuries that can occur in the workplace if an individual fails to use eye protection, such as those from chemical splashes, swinging objects, wood/metal chips and radiant energy from welding. In training employees learn about the use of protective helmets or hats that resist penetration by objects and absorb the shock of a blow. Students learn that most head injuries occur when a person is looking away. Many professionals such as linemen, construction workers and timber/log cutters should be required to complete personal protective equipment training and wear head protection. Personal protective equipment training programs cover the need for foot and leg protection for employees who might experience falling or rolling objects. Workers who are exposed to hot surfaces, poisonous/corrosive materials, sharp objects or electrical hazards should complete this training. Employees in training should learn about leggings, safety shoes, toe guards, metatarsal guards and foot/shin guards. 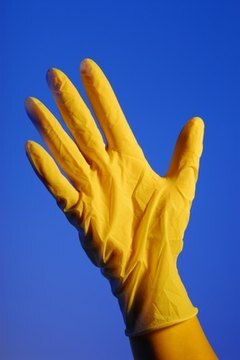 Employees who run the risk of absorbing harmful substances or acquiring burns, fractures, bruises or amputations should complete hand and arm personal protective equipment training. Students learn how to choose gloves based on a variety of factors such as size, comfort and the kinds of chemicals they can handle. They learn how different glove materials--such as leather and synthetic material--are effective in different situations and the differences between disposable and reusable gloves. Employees who might experience cuts, radiation or hot splashes are trained on use of protective clothing. Students learn about body protection options such as lab coats, surgical gowns and full body suits. Personal protective equipment training covers the occupational noise exposure levels that require hearing protection for employees. Information about earplugs and earmuffs is part of this training. King, YaShekia. "Personal Protective Equipment Training." , https://legalbeagle.com/6324055-personal-protective-equipment-training.html. Accessed 18 April 2019.